Halifax have signed the Castleford front rower Ryan Boyle on a season long loan deal. The 28 year old forward, who has made six Super League appearances for Daryl Powell’s side this season, will not play in Friday’s Championship clash with Oldham, but is expected to be in contention for next weekend’s Summer Bash meeting with Featherstone at Blackpool. Boyle made his debut for the Tigers in 2005 and has spent the bulk of his career at Wheldon Road aside from a three year sabbatical at Salford. The Ireland international will bolster coach Richard Marshall’s pack options at the end of a week which began with his forwards being outmuscled at Batley. He is the third loan signing in the last fortnight, following on from Salford back rower Matt Sarsfield, who made his debut at Batley last weekend, and Red Devils prop Jordan Andrade, who has been confined to the reserves. 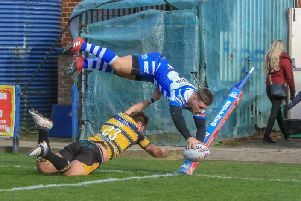 While Boyle comes in, another former Castleford player, winger Tommy Saxton, has left the Shay on a temporary deal, linking with League 1 side York. Saxton has found his opportunities limited so far this season, with James Saltonstall and Will Sharp currently holding down the flank spots and Gareth Potts and Jake Eccleston waiting in the wings.